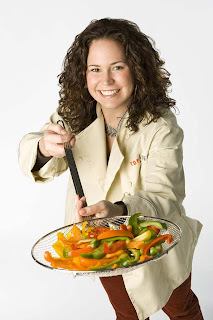 Got Buzz @ Kurman Communications: Another win for Chicago as Stephanie Izard takes the Top Chef crown! Another win for Chicago as Stephanie Izard takes the Top Chef crown! I'm obsessed with Bravo's Top Chef! (Ok I'll admit it, I'm obsessed with every show on Bravo). But I first became a Top Chef fan during Season 3 when Kurman did an event last fall with "chef"testant, Sara Mair who ended up finishing fourth. Naturally I was pretty excited when Season 4 was being filmed in Chicago, and that two stellar chefs were representing the Windy City. Right from the first episode, Stephanie Izard became my favorite. (I was probably a bit partial to the name). Last night Steph pulled through for Chicagoans to beat out the mohawked Richard Blais and eternally frowning Lisa Fernandes to become the first female to be named Top Chef! Word is, she's already been scouting locations for a new restaurant in the city! This comes less than a week after Grant Achatz of Alinea, and Carrie Nahabedian of Naha earned huge props at the James Beard Foundation Awards in NYC. If anyone every doubted Chicago's ability to be on top of the culinary scene, they better be thinking twice! Want to learn more about our stellar gal? Check out this interview with Izard in the Chicago Tribune. CLICK HERE for DavidDust's Top Chef Chicago recap. And look for my Project Runway recaps next month!